One of the great things about blogging is the editorial freedom that it brings me and so when friends and family make a special request for a feature, I like to make it a reality for them, simply because I can. So when my amazingly talented Sister recently asked if I could offer her some inspiration on re-modelling her Christmas decorations this year, I leapt at the task with elfish skips of joy! As luck would have it, shopping for Christmas decs is one of my very favourite things to do at this time of year and having built up quite a collection over a number of years, including a beautiful glass bauble from a recent trip to Venice, I love to treat myself to one or two new items each year - this way I feel like I am the curator of a growing collection. I also love the intricate process of un-wrapping each of the more delicate decorations after their year long hibernation and re-familiarising myself with each of the designs, especially some of the more sentimental objects like those passed to me by my Gran - it's the #SimpleThings. With the growing number of temptingly good decorations to choose from each year, this festive period is the best yet! Therefore, I have broken down my selections into three different styles with the first being 'Simplicity'. 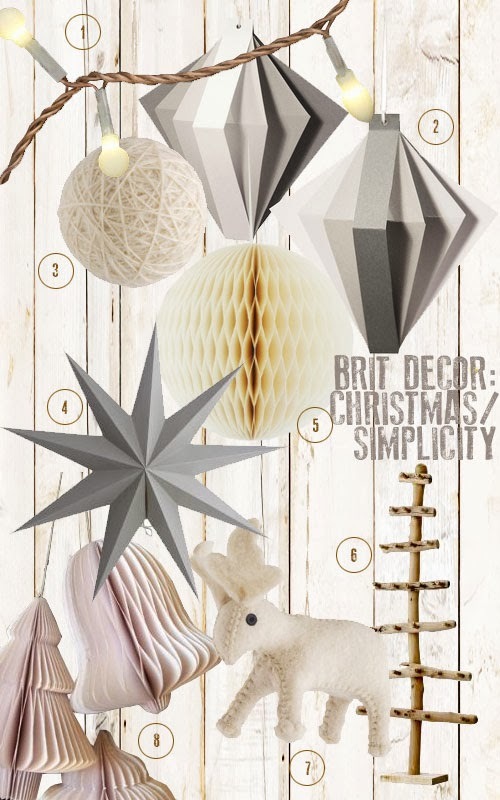 True to my minimal roots, I love the simple elegance and sophistication of paper decorations which I am pleased to see are trending massively this year and these work really well in neutral tones mixed with greys for subtle contrast. With this theme it's more about texture and design than it is about colour but don't forget to add in some simple chain lights to add a magical sparkle to your scheme. Which style will you be opting for this Christmas...?